Wondering which type of paint is the best to use on furniture? Is chalk paint the best to use for furniture? What other types of paint can be used on furniture? This post attemps to break down the different types of paint for furniture and the pros and cons for each, including the best paint for furniture. If you’ve ever painted furniture, or started looking into how to paint furniture, you’ve seen all the different types of paint that people swear is the best paint for furniture. I must say, I would never be able to commit to using only one type of paint for my furniture painting, because I’ve found that each one is best in certain circumstances. I’ve used most types of paint, many different times, and feel as if it’s time to break down all of the different types of paint I use to paint furniture. I’ve included the pros and cons of each of these types of paint, my tips for using it on furniture, my favorite uses for each one, along with the projects I’ve completed with them. Just click on the picture of the project to be directed to a complete tutorial. After reading, if you’d like a furniture paint “cheat sheet” with all the information in this post in a very truncated (but printable!) version, just sign up to receive my newsletter. I hope this post is informative and helpful! Overview: Latex paint is the type of paint you can buy from any hardware store. It’s water-based and comes in a variety of sheens ranging from flat to gloss. It’s the least expensive option for painting furniture. It’s tintable to pretty much any color you can imagine. If you don’t love any of the paint swatches, you can bring in a paint swatch from another company, or have the store color match it to an item you bring in. 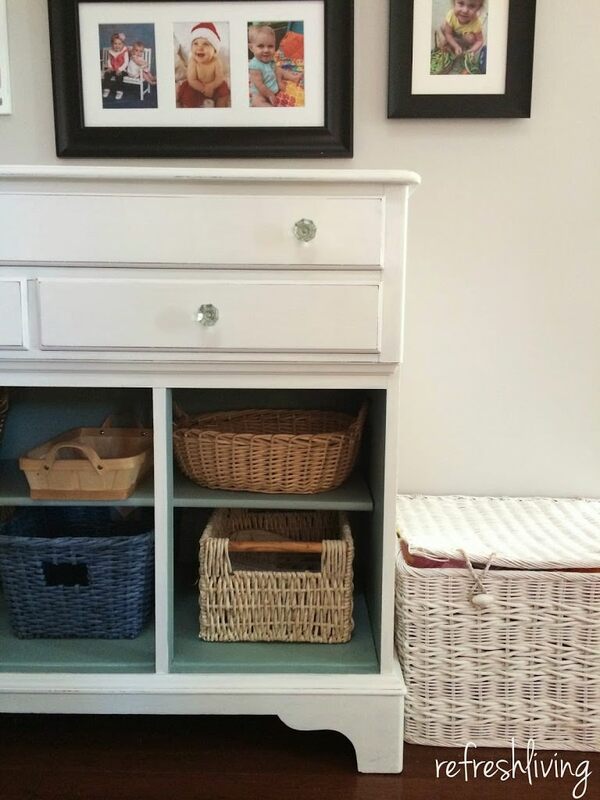 Yes, you can paint a dresser to match the color of your favorite shirt! It comes in many different sheens (flat, eggshell, satin, semi-gloss, gloss) which allows you to choose the amount of shine you’d like on your piece. The glossier sheens (satin, semi-gloss, gloss) don’t really need a top coat. You definitely need to prep your furniture piece well before painting. I would recommend sanding and priming with a good, strong primer (this one is my favorite primer for furniture!) which is time consuming. Here’s an entire post devoted to priming furniture before painting. The finish never seems as durable to me as I’d like. I often find pieces at thrift stores and garage sales that have been painted with latex paint and they are peeling, chipping, and scratching like crazy. Now, this could be a result of poor preparation, but either way, it’s important to note that latex paint requires correct preparation. Honestly, I almost always turn my latex paint into a homemade chalk paint if I want to use it on furniture. I’ve found it requires a little less prep (I always sand, but don’t need to prime) and adheres better to the surface. 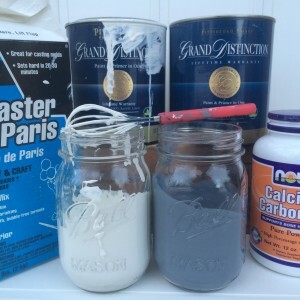 Uses for Latex Paint: I don’t generally use latex paint for interior furniture, unless I change it into a chalk based paint (here’s my favorite way to make my own chalk paint), or if it’s unfinished wood. I will use exterior grade latex paint for the furniture pieces I build. It adheres to the raw wood nicely and holds up well to the elements. Overview: I’m sure you’ve heard of it; it’s taken the furniture refinishing world by storm. It’s a chalky, water-based paint that requires very little prep work. It finishes in a soft, matte finish. There are a large number of companies that make “chalk paints”. I’ve used paint from five different companies, and I’ll say that they are all very comparable. Prep work really is minimal. I always sand anything I’m painting, but chalk paint really does stick well even to glossy finishes. It dries really quickly, allowing you to re-coat sometimes in an hour or so. It’s very easy to distress, so if you’re looking for a shabby-chic look, chalk paint is great. It really is silky smooth to the touch once it has dried. It dries very quickly, which means that brush strokes show up more more easily. Keep reading for my tricks on how to help with this. It’s thicker than other types of paint, almost too thick for my liking. I’ve read you don’t need to add a top coat, but I’ve found that if I don’t use a top coat, it distresses, in other words, it can be scratched off, too easily. I always sand all of my furniture pieces, and I would recommend doing the same, even with chalk paint. I’ve found that if I add water to the paint (at about a 5%-10% ratio) it’s the perfect thickness. In order to avoid brush marks, leave the paint alone once you’ve painted it on. Sometimes, it’s tempting to go back to a spot that’s already been painted to perfect it. Don’t do it with chalk paint! It dries quickly, and if you go back, you’ll feel your brush dragging through the paint, and it will leave more brush strokes than were there before. 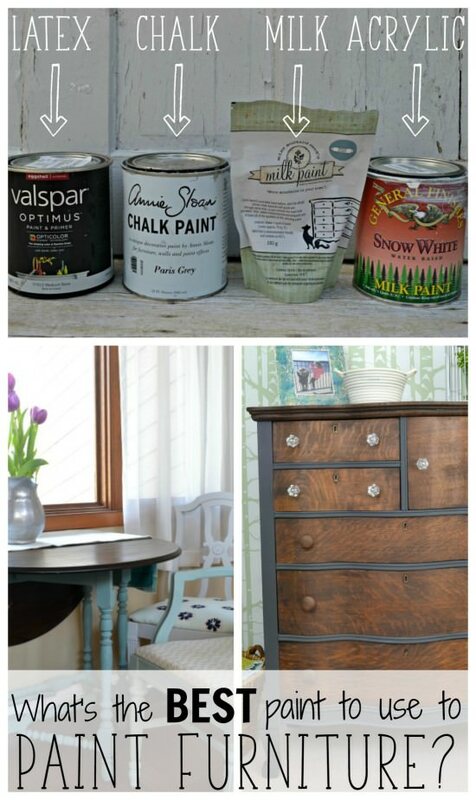 Uses for Chalk Paint: I enjoy using chalk paint to create a rustic, matte finish. If I’m wanting to distress to show wood the wood underneath or if I want a super flat finish, I use chalk paint. 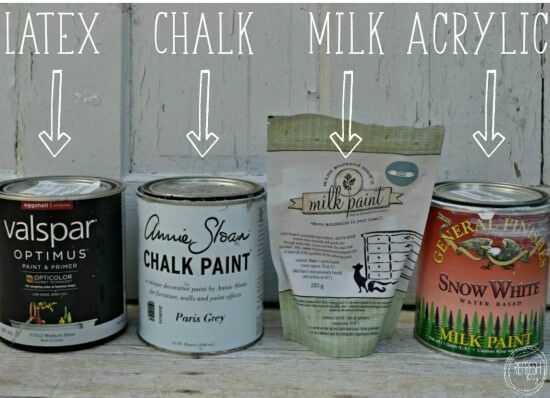 Overview: Milk paint is an all-natural paint made with, you guessed it, milk protein! It’s been used for centuries and creates a natural, old-world look. Milk paint is known for creating a chippy look, but it actually is fairly versatile and can be used to create different finishes. It’s made with all-natural ingredients (from the earth, not scientists!) with no VOCs or chemicals. It comes in a powder form, so you only mix up the amount you plan to use. It penetrates the pores of unfinished wood. If you strip a piece of furniture or find an unfinished piece, milk paint won’t just sit on the surface, it will actually penetrate the wood. It gives a beautiful look! It can be a tad bit unpredictable if you’re applying it without the bonding agent on pre-finished wood. It’s difficult to know just how much it will chip until you actually apply it. It may chip more over time if the bonding agent is not used. Now, this creates a time-worn look that mimics the look of antique furniture (because milk paint was used to paint a lot of those pieces! ), but when I’m selling those pieces, it makes me a little nervous. If you apply additional wax or topcoats it will slow down the chipping, but I always feel bad telling customers that they’ll need to upkeep the finish or the paint will continue to chip. After it’s mixed, you need to use it. There’s no storing the paint on the shelf to touch up the piece in a couple of months. Remember, it’s made of milk protein… You’ll have a smelly, sour milk mess if you try to keep it. If the thought of chippy paint scares you, use the bonding agent. You can apply less than the suggested amount and you might get a little bit of chipping. But then again, you might not. (Remember, it’s unpredictable!) If you apply the suggested amount of bonding agent and sand your piece, you won’t have any chipping. I always sand pieces before I paint, but especially if I plan to use milk paint without the bonding agent. I’ve found that if I don’t sand and don’t use the bonding agent, the paint does not adhere. The paint sticks to the places you sand more. If you miss a spot, you’ll see chipping in that area (without the bonding agent). 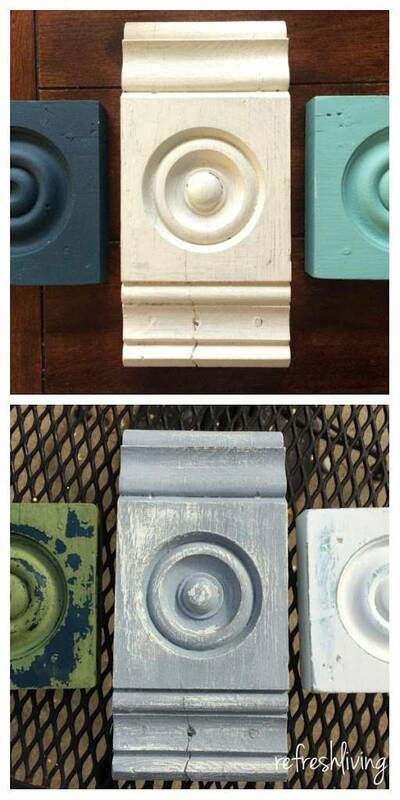 Uses for Milk Paint: I love using milk paint to make washes for unfinished wood. By adding extra water when I mix the paint, it shows off the grain of the wood beautifully. Milk paint is also my go-to paint for antique furniture pieces. 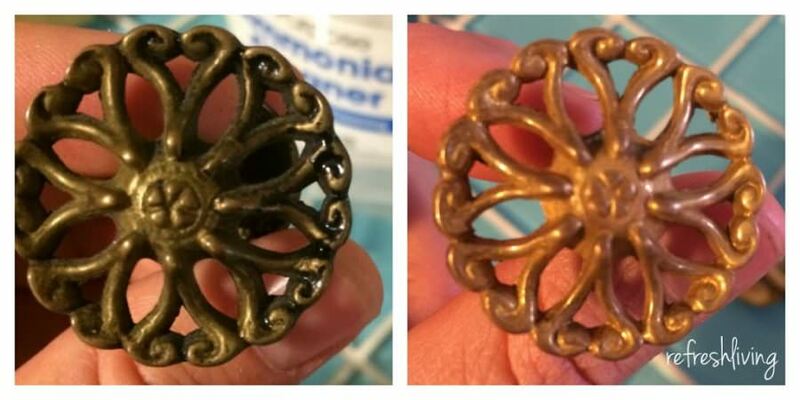 If I know a piece is 100 years old or more, I love to use a paint that would have actually been used back then! Overview: The name “General Finishes Milk Paint” is a tad bit misleading, because this paint is actually a water-based acrylic paint, engineered to give a similar finish to the milk paint that has been used for centuries. It can be used for both interior and exterior applications. It does not require top coat like chalk paint or milk paint. Its finish is strong, but a top coat can be added for extra durability. It levels beautifully. Honestly, I’ve never used a paint that smooths out so nicely as it dries. Simply put, you might see brush strokes as you’re painting, but once this paint dries, those brush strokes are gone! It has a little bit of a longer drying time than chalk or milk paint, which means that it gives you a little extra time and flexibility to catch a drip or fix a mark without it ever showing once it dries. I’ve read some people say you don’t need to sand prior to using this paint. It does adhere well, so they might be right, but I’ve never tried it out. I always lightly scuff up the surface with 220 sandpaper and it always has adhered perfectly. Either way, it’s less prep than most other paints require. If you’re looking for a super-matte finish, this paint won’t work. It’s definitely not shiny, but it does have a slight sheen to it. I’d compare it to an eggshell finish. 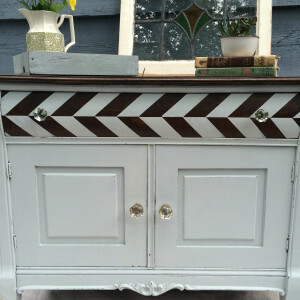 It can be distressed, but it’s not as easy as chalk or milk paint. Plan to use a bit more elbow grease to take off the paint, or distress it right after it has finished drying. This is the most straightforward of all of these types of paint. Lightly sand, and then start painting! If you see a drip or puddle, there’s usually time to go back with your brush to fix it. I love using General Finishes Flat Top Coat if I need a strong finish on a piece (painted dresser tops, chippy milk paint, table top). It can be used over any of the paints I have mentioned in this post, and gives a flatter sheen than any topcoat you’ll find at the home improvement store. Uses for Acrylic Paint: I’ve found a use for this paint practically everywhere. I think it’s a fabulous paint to use if you’re new to painting furniture, because it doesn’t require much prep, and is very easy and forgiving to paint with. This is the only paint in the bunch that I have used to paint cabinets (both kitchen and bathroom) with beautiful results. It’s durable and cleans up well. Now, which is the best paint for painting furniture? I would never be able to choose just one because I love certain characteristics about each one. When I’m painting furniture for clients, I always use one of the specialty paints (chalk paint, milk paint, or acrylic paint), but the one I choose always depends on the look they’d like. Sorry I can’t give you a clear cut answer, but hopefully the information I included will help you to make a decision on the best paint for you and your project! If you’d like a printable version of this information to keep as a reference for later, I put together two charts highlighting the main qualities of each of the types of paint. Plus, it includes a chart with specific brands for all of the types of paint mentioned in this post. 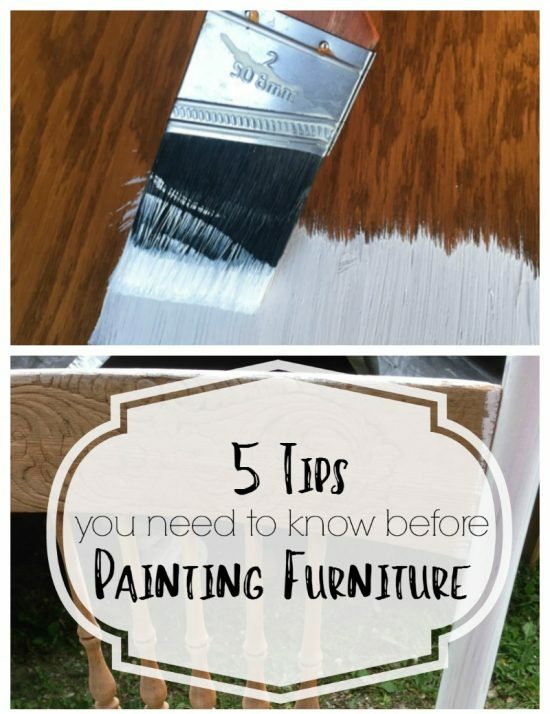 If you’re ready to start painting, I have the five most important tips to remember when painting furniture. I learned almost all of these by trial and error, so if you read up before getting out that paint brush, you’ll probably avoid a lot of the mistakes I made! So much of furniture painting is trial and error. Once you use a certain type of paint, you’ll figure out how best to use it and your own personal preferences. 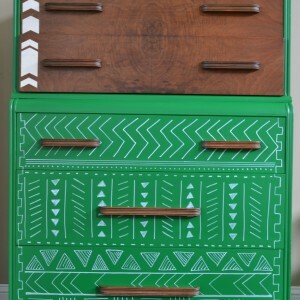 If you’ve never painted a piece of furniture but have been thinking about it, give it a try. You’ll be impressed with yourself. 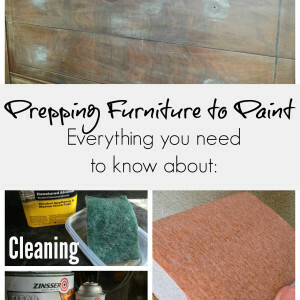 Here are a few more posts that might help you on your furniture painting journey! For years, I wondered if there was a difference between the different levels of paint available at the home improvement store. Being a budget decorator and remodeler, I usually just bought what was on sale, or one of the lower grades of paint. This past year, I was painting a very large, very red wall and knew I needed to put different types of paint to the test. Here’s what I found to answer the question: Do I need to buy the most expensive paint for walls? Thank you for putting this guide together! I am a total newbie to furniture painting, and am almost ready to start my first teeny project, painting an old desk chair from my childhood. This info will help me figure out which paint to use. HI Jenny, I also love this article and I too am a newbie, which brings me to my question because I’m still not sure of how to proceed. I have a French provincial dresser I’m planning to refinish for my 4 year old granddaughter. This dresser was already stripped once and refinished only with 2-3 coats of a polyurethane top, no stain. My plan is to strip it, sand it, prime it and paint it white. Id like it to have some sheen maybe between an eggshell and satin. My question is, what paint would be best for this job? Should I also give it a protective top coat, if so, what product? How many coats of each thing? Should I sand at all between coats? I don’t want any distressing or chipping. I guess these are more than one question but I’d really appreciate your input. Thank you in advance. Hi Beatriz! I have a couple ideas of what I would do to get the type of finish you want. If the finish on the dresser is in good condition right now (no peeling or chipping) then you probably don’t even have to strip and sand it, which will save you a TON of time! However, if it was finished with polyurethane, you’ll want to prime it (like you said) because polyurethane yellows overtime and it may bleed through white paint. As far as the paint, I would recommend General Finishes paint. It gives a very subtle sheen (I’d equate it to an eggshell), covers really nicely, and I love to use it when I don’t plan to distress at all. I’ve used this paint without a topcoat and it holds up well, but I think for your dresser you’ll probably want a topcoat. You can buy regular Polyacrylic at most Home Improvement stores, but I’ve only seen it in satin and gloss finish, so it will probably end up being shinier than you want. General Finishes makes an acrylic topcoat in flat (I think it’s called High Performance Topcoat in Flat) and it gives an eggshell/satin finish. I used to use Polyacrylic, but once I tried GF topcoats, I was hooked and will never go back. 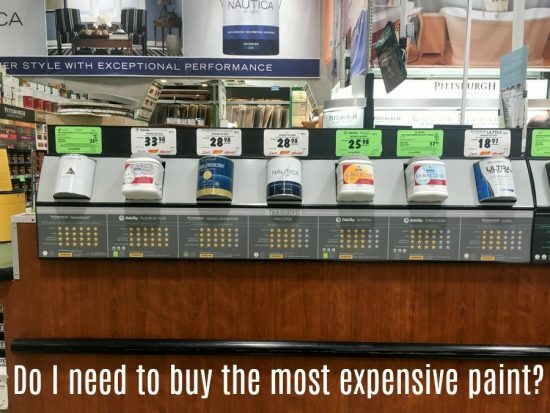 With that being said, they are more expensive, so that is definitely something to consider. As for the number of coats, because you are priming, you’ll probably only need to do 2-3 coats of white paint (a quart will be plenty for a dresser). I always lightly sand between paint coats, but not after the final coat. Same goes with the topcoat. Lightly sand between topcoats (2 coats is usually what I do), but you won’t sand after the final coat. You’ll want use a fine grit sandpaper (220 grit). Sorry for the lengthy response. I hope it was helpful! Let me know if you have other questions, and best of luck on your dresser! 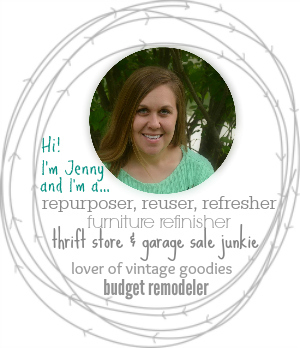 Jenny is right-on! I tried using Minwax Polycrylic and it was awful. I only did a small section before stopping and returning it to Home Depot. I then went to my neighborhood professional paint store and asked what they recommend for a top coat poly. I already had General Finishes in mind but wanted to know what the “expert” would say. He said, General Finished High Performance. I told him I tried Minwax and he said that is the worst product now. They used to be great but he said that the company was sold and ever since- the quality has been horrible. BTW- GF has a flat option, too, if you want the flat, matte look. Thank you for this post. I’ve just finished an old table (found by the street) and it did not turn out like I wanted it to. Oh well, I can always do over. This is a fantastic post!! Love it. Just pinned it to one of my biggest DIY group boards because people should read this! Oh, thank you so much, Bre. I’m so glad you liked it and are sharing it for others! This is a fantastic post!!! Thank you for this post. Just Love it. Milk paint seems really interesting, I never heard of it’s existence before. Those example pictures you gave for it look really incredible though, I’d love to try it on something of mine. The older weathered look is one of my favorite things to have on my furniture. Yes, milk paint is definitely the one I would say is for you! It’s really fun to work with because it’s so different than all the others. Thanks for visiting! Hi Bev – Don’t worry at all, I think by mixing the latex and chalk paint you should be totally fine. The chalk paint gave your latex more gripping power, so I’m sure it’s adhering just fine. Honestly, you would have been able to tell right away if they weren’t mixing properly or if it wasn’t sticking well. As for the finish, wax will give a very low sheen, soft finish, and any type of poly will give a shinier finish (with a little more durability). Either one should work well, it’s more of just an aesthetic choice. I’m so glad you shared this and to know it worked out! Good luck finishing up your piece! This is SO helpful!! Thanks for this post Jenny! Thanks so much Heather! I’m glad it is helpful. Jenny, Thanks for an excellent explanation of the different paint types. I’ve only used chalk paint (the one in your photo) and absolutely love working with it. I would love to try the General Finishes ~ just need to find it. You’re so welcome – I’m glad it was helpful! I use chalk paint for a lot of projects, but now that I’ve tried a couple of others, they are my favorites for certain types of projects. I’ve noticed that General Finishes seems to be putting paint in a lot more retailers in my area (you can go to their website and search your location) or I know they also carry it on Amazon if you were wanting to give it a try. Happy furniture painting! That’s great info! Thanks for all the tips here Jenny. 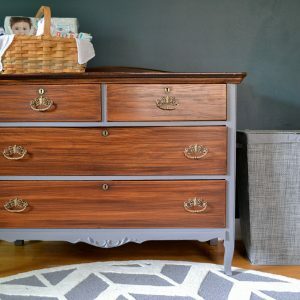 I had no idea about all those details and my next attempt with chalk paint is to paint a part of a rug with it, not the whole thing, just on the sides. Any thoughts?? 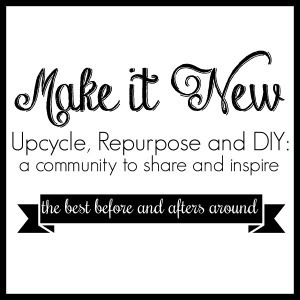 Thanks for linking up at Sweet Inspiration #2, have a fantastic weekend! I’ve heard you can paint rugs and upholstery with chalk paint, but I’ve never tried. I wonder if you’d need to top coat it, or if it penetrates differently into the fiber where it won’t rub/scratch off? Let me know how it goes! When using chalk paint, such as ASCP, you just use a spray bottle with water in it. Spray the fabric FIRST, lightly but enough to dampen without saturating it. Mix paint about 40-60 water: :paint. Yes, that makes it very watery. It’s what you want. Thick layers will result in chipped paint on fabric. So, just spray water, paint with watered down paint, wait for the layer to dry, lightly sand. Repeat. It may take up to 6 coats to get the paint opaque, so be patient. After final coat- soft wax. I painted a horrific fabric bench in Annie Sloan’s Scandinavian Pink. It looks beautiful now. It doesn’t crack and the wax keeps it protected. I forgot to mention- you can also paint other materials such as leather! I painted a 90’s leather chair that was in great condition, but the color was dated. 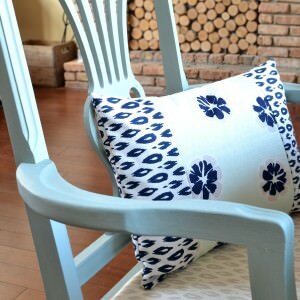 YES- you can paint leather with chalk paint! Use about 30% water: 70% paint mix instead. No need to be exact, but it can be thicker than painting fabric since you don’t want it to drip. The most important thing- keep thin layers between coats to avoid cracking (unless that’s the look you want). Thicken it if the paint runs/drips. The process is the same as above for fabric. Number of layers will be less because leather or vinyl isn’t as porous as fabric, but the results are the same. Don’t forget to soft wax at the end. I wax about 2 layers for areas that are not used as much (outside back and side of chairs) and 3 layers of soft wax on the seat, back and arms. Is it possible to turn gloss latex paint into the chalk paint to use on the top of a dining table? Or would it be better to paint with it “as-is” and then maybe even add a top coat of clear poly? 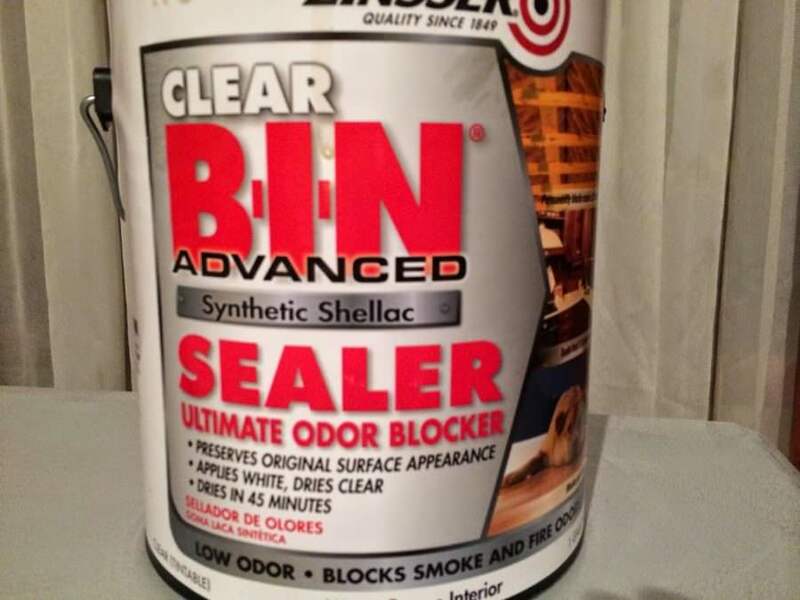 Hi Heather – I don’t think gloss latex paint would mix well with the calcium carbonate, but I’ve honestly never tried. I would probably just paint it with a more matte paint and then cover it with a top coat. A clear polyacrylic would be the best, because it doesn’t yellow over time like polyurethane. Good luck! This post is amazing! I’ve always been an artsy person, so getting into furniture repainting just seemed right. That being said, I had no idea what paint to go with. This post has helped a ton, thank you so much!!! I’m not a huge fan of distressed stuff, and I like keeping things simple, so I think acrylic will be the best bet for me. Thank you so much for this post. This is exactly the information I’ve been looking for, and more!! This was so helpful! Thanks! I’m wanting to redo my kitchen table, chairs and stools. They have the wood butcher block tops and hunger green legs! I am going to look into the General Finishes paints now. I wonder if they are durable enough for the chair seats? I wasn’t sure if I should leave those wood or paint them. They need to be sanded and a new coat of poly at least. It would be so much easier just to paint them! I can totally picture your kitchen table set! I’ve used General Finishes on a lot of pieces, but not chair seats, yet. My thought is that it would probably hold up pretty well, because I’ve use it on dressers and table legs without sealing and it has been fine. But, just to be safe, you could add a topcoat which should really be fine. Because you are doing chairs, you might actually want to splurge and just get a couple of cans of clear topcoat (Polyacrylic or another acrylic based topcoat). It will save you a lot of time in the long run, because painting poly on spindles is no fun at all. Oh, one more thing. If you wanted to change the color of the stain of the seats without sanding, General Finishes makes a gel stain that “restains” over existing finishes. You’d just need to do a light hand sand rather than strip them all the way down. Good luck!! I am painting a dresser and thinking of going with the acrylic milk paint – do you have a favorite brush or roller you like to use? I actually just use regular paint brushes from the hardware store and they always work well for me. As for rollers, I also use foam rollers, but I’m not partial to any particular brand. Good luck on your dresser! 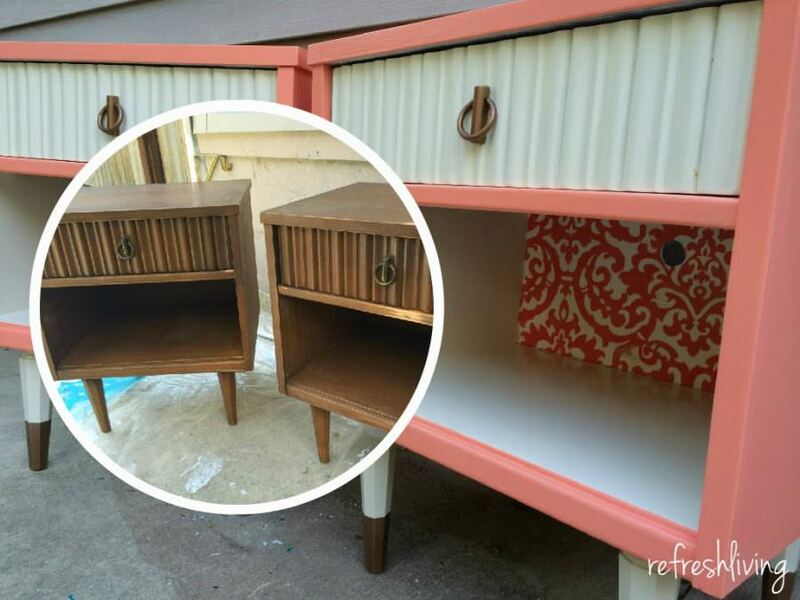 Have you tried Repurpose Recolor paint yet? If so how does it compare to the others? That sell it in a store near me and they said it’s easier than chalk paint. I want to paint a couple of old wooden dressers. Awesome post! I have a question… I’m in the middle of painting my pedastool oak table and started with valspar furniture paint but not real happy with results. Can I paint over that with milk paint? Same color ? Hi Amanda. Thanks for the question. I don’t really like using milk paint to paint over something that’s previously painted, unless I’m trying to do a distressed, two color layer finish. Although, if you do milk paint with the bonding agent, it will probably work and stick just fine to the first layer paint. I’d make sure to do a topcoat (and maybe you already were planning on it) if you do paint with milk (or chalk) paint on a table, because it will see quite a bit of use/wear and tear. I hope that helps. Let me know if you have any other questions. Hi there! I feel like I have read & reread this post multiple times to try to figure out which paint option would work best for my first “major” project. I’m pretty crafty, and love decorating. I’ve painted an entire bedroom set for my daughter, ( I feel like I just used a latex paint with a poly top coat). For the end tables I want to start (I’m terrified to start them because in my head, I want them to look a certain way.) They’re older tables, not too shiny at all. I want them to be closer to a matte finish ( a little sheen is OK), and I’d like to try a little distressing around the edges. What would you suggest that I try? For some reason, I’m a little interested in the milk or chalk paint, but the wax coat makes me nervous (I don’t know why)…because I’m afraid I’ll do it “wrong.” Any particular brand you’d recommend? You mentioned Janesville so I figured whatever products you used I could probably get a hold of (I’m about an hour away…Union Grove, and we have a permanent place in Milton, so I know the area). Thanks for any help/advice! I think it sounds like you could use chalk paint and probably be really happy with it. The great thing about it is you don’t have to use a wax as your topcoat, you can definitely just use a regular clear one. If you do end up going that route, I’d recommend an acrylic top coat (because it won’t yellow over time). I think you might be able to find matte or “eggshell” like topcoats in home improvement stores now, as most stores are carrying more furniture painting supplies. My favorite topcoat is General Finishes High Performance topcoat in Flat, but they only carry it in specialty stores and online. Let me know if you have any questions – I hope that helped! Thanks for the detailed post! I have read this too many times to count while trying to decide the best plan of action for the project I am working on, maybe you can help? I am painting a nursery set for our baby boy on the way this summer, its a new set, but I didn’t want white so I need to paint it. It seems like the General Finishes Milk Paint would be a great choice in terms of durability, but I am not sure if the colors will work, especially since I can’t see them in person, just online. So I was thinking of possibly making my own chalk paint using your tutorial with a latex paint, and then using the General Finishes Top Coat you mentioned. Do you think that would hold up well in a child’s room? Also, do you know if the DIY chalk and Acrylic top coat are OK to use while pregnant? Hi Jenna, I’m sorry I didn’t get back to you sooner. Yes, I think a homemade chalk paint with the acrylic topcoat will work and hold up well! For the chalk paint, I would recommend using calcium carbonate instead of plaster of paris – I like the way it paints and the finish much better with calcium carbonate. As for safety, an acrylic is very similar in terms of safety as latex paint is. I use both when pregnant, just make sure that the space you are painting in is ventilated (as is recommended no matter what). I usually wear a simple mask when I’m pregnant and painting, but you’ll find the fumes to be pretty minimal with both latex and acrylic. I hope that helps. Good luck with your piece of furniture and congratulations on the upcoming little baby! I am going to paint chairs and a table. I’m leaving the wood seat and table top unpainted for now. Your post for different kinds of paint is very helpful. I want to use latex paint. Since I am a newbie at this, I have read a lot in order to get started. Can I use a primer/paint combo like your picture of Valspar in this article, or do I need to separate the steps and primer everything with a primer only, sand it, and then apply paint it with latex only? Hi Katie! I think it would depend on what type of finish you are painting over. If you’re painting over an unfinished wood, I would just go with a paint/primer in one. For furniture with a glossy finish, I always prime first, and then apply latex paint (that usually has the primer in it as well). With that being said, I’ve never tried to use a paint/primer latex paint over a glossy piece of furniture, so it might work, but I don’t really know. Sorry that wasn’t very helpful! Thanks for this post post, it is so informative! I do have a question if you don’t mind helping me out. My husband builds dining tables. Usually we just stain and poly the tabletops, but we have a client who wants a distressed white tabletop. We are planning to stain the wood dark and then paint over it, and sand to distress. What kind of paint do you recommend? We need the finish to be hard and durable – no scratching off of cracking. Hmm. So if they want it truly white on top, you’ll want to put polyacrylic over the stained wood, I think, and then put the white paint over it. 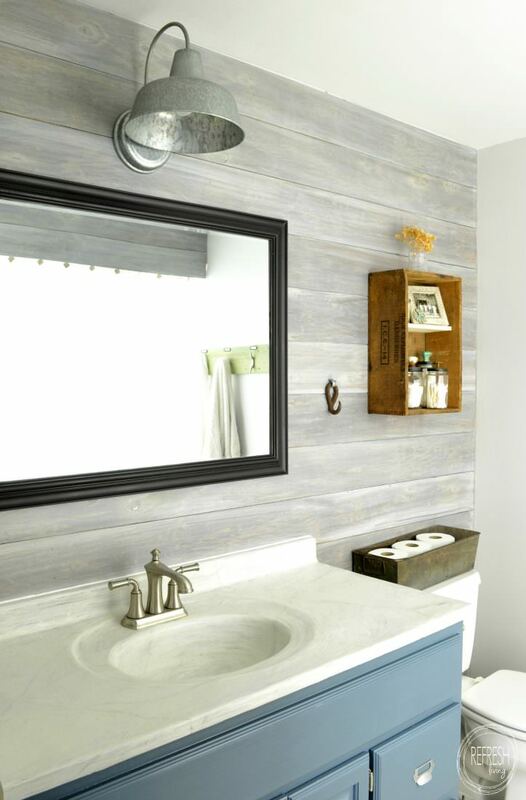 If you just put the white paint over the stained wood, it will be more of a gray distressed look, like this wall. So when painting over poly (I would also lightly sand it to rough it up) you’ll need a paint that has good grip. I think I would use General Finishes acrylic paint. It’s tougher than chalk paint for sure. However, with that being said, since you’re doing it on a tabletop, I would still be sure to seal it with a couple of coats of clear acrylic. I hope it works out! I would do a test application on a piece of scrap wood first to be sure that’s the finish they are looking for. Let me know if you have other questions! Thank you, Jenny! I really appreciate your advice! Thanks so much for this post; it’s so helpful! I do have a question for you: I’m painting a dresser that I’m going to convert to a vanity (probably add marble on the top to do so). I think, based on what you wrote, that the acrylic option would be best (with the top coat you recommended). Is there anything I’m missing here? In other words, is there some other sort of top coat or treatment I should be sure to use when doing a vanity rather than a dresser? Thank you so much! Hi Bree. Sounds like a fun project! Yes, I think that the acrylic paint would work best for that. I actually painted my bathroom vanity with General Finishes and it’s holding up really well. Good luck! Hi Jenny thanks for the post but I’m a tad bit confused & hope that you will be able to help me out? I have bought a few months ago 2 bedside tables that have been white washed but now I have noticed that under the coasters that there are water marks, obviously or should I rather say expect that they have not been vanished or sealant added to the finish. Being OCD (haha) I’ve also noticed a few chip marks or places (like the back) have not been properly painted. I have heard that you can buy white wash paint that has a sealant or vanish added to it but then that mean that I have to prep the Whole table or can it be used to for a touch up? Now my confusion comes to what paint can I use to touch up these unsightly chips etc? Hope that you will be able to give me some insight to my little dilemma? Hi Charlotte. Here is what I’m thinking about what you said. The water marks could have actually been in the wood prior to painting. Sometimes paint can hide water marks for a little bit, but then they eventually show through. Or, like you said, they could be from the tables not being sealed. Water marks are tough to get rid of. What I would recommend is a sealant to cover the water marks, and then to dry brush a white paint over that part to try to hide the mark. Miss Mustard Seed’s Tough Coat should work really well. The trouble with matching it is that without knowing the type of paint used, it will be pretty hard to match it exactly. Luckily, whites are usually similar and you probably will be able to get away with matching it pretty well. I haven’t heard of white wash paint with sealant in it before, but that certainly doesn’t mean it doesn’t exist, I just haven’t used it. A true white wash is actually supposed to penetrate the wood (similar to a stain) and really should chip at all. However, if it was added on top of something that had already been sealed or painted, the “whitewash” will come off easily if it’s not sealed. You can actually use that Tough Coat as a topcoat sealer too for the whole piece. Okay, so I would add the touch coat over the water stains, get a little white paint (you could probably get away with using white acrylic paint from craft stores, actually, or a chalk paint will work well too) on your brush. Dab off most of the paint onto a wet paper towel, and then lightly brush over the spots and places that are chipping. After you’ve touched up the spots, I would go over the tables with a sealant. Let me know if you have any other questions and how it ends up going. Good luck! thank you for such an informative post.. 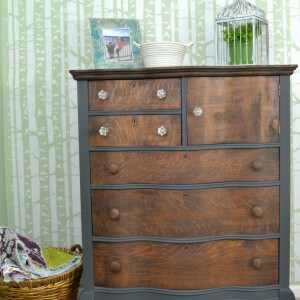 I am planning to chalk paint my dresser and night stand.. But I was thinking, after the chalk paint do I have to wax the furniture or can I leave that part?? Annie Sloan chalk paint and wax , together they will be expensive, that’s why I am thinking is there any way to leave the waxing part to save money!! Or is there any other inexpensive proces to protect the paint? Because we keep water bottles,, coffee mug on top of the night stand..
Hope that you can give me any solution… thank you.. Yes, you’re right in that you’d definitely want to protect it. There is a cheaper furniture wax made by Minwax. It’s sold in home improvement stores, but here is what it looks like. Also, I often use a clear acrylic (either spray or brush on) over chalk paint instead of wax and it gives it durability as well. Best of luck on your project! Hi Jenny, this post is exactly what I’ve been looking for. I’ve read through it but would still like to double check with you on how I should proceed 🙂 we painted unfinished kitchen chairs a light blue color 2 years ago. I have two young boys, so you can imagine the beating they get. They are stained, hard to clean, and the paint is already coming off around the seat edges, tops of the chair backs, etc. I believe my husband used a primer and two coats of latex paint using his compressor. What type of paint would be more durable and easier to clean? And with the paint you recommend, can I get a very specific color? Thank you so so much for your help, i’m really hoping that when we paint these again it will last longer than 2 years and be easier to keep clean! Hi Bridget! Yes, I can totally imagine the beating those chairs take! It sounds like he painted it just the way he should, but unfortunately any type of paint will wear over time with lots of use. I personally prefer acrylic based paint and find it holds up best when I use a polyacrylic top coat over it. I love General Finishes, but they don’t offer a custom color mixing, which is definitely a drawback. They actually also have a chalky type paint too, in different colors, but it’s much less chalky than any other paints, and I personally would still use it on chairs with a top coat because it wears pretty well. I think you could also do a chalk type paint (Rustoleum makes one now that is sold in hardware stores, and you can get it custom color mixed I believe.) I think my best advice would be to make sure to give whatever paint you choose a couple layers of an acrylic top coat. Let me know if you have other questions. Good luck! I’m so happy to have found you! I painted all of my kitchen cabinets white, with AS chalk paint. They turned out great, just not real happy with some streaks I have after waxing. I decided to do the island a navy blue. Well, it’s a disaster – roller marks, streaks from wax, etc. So….I have decided to paint the island with the GF milk paint. Most of the island has not been waxed. But the doors and drawers have been. Can I paint right over the wax or do I have to either use mineral spirits or sand it to get it off? Also, can I just repaint over the chalk paint ( the parts of the island that has no wax)? Thank you so much!! Yes, as long as the wax has cured (which I think takes quite awhile, perhaps a few weeks?) you can paint directly over it. I’ve actually only painted over cured wax with chalk paint, but I really think that GF milk paint will adhere just fine. I would use a 220 sand paper to give it a little grit prior to painting, but you shouldn’t need to completely remove it. And yes, you can definitely just paint over the chalk paint with no problem at all. Let me know if you have any other questions. I would actually love to hear if the GF paints well over the cured wax. I hate to give you advice without being 100% sure, but I’m pretty sure it will work! You are not alone. I have yet to do a project without some soft wax streaks. I read somewhere that you should soften the wax to almost a liquid (i’m going to use a make-shift double broiler next time), then apply. I also found that not wiping it as you go along and then treating it as one big area and wipe away the wax helped a lot. Also, a second wax coat usually takes care of those awful streaks. For furniture, I just gave up and use a poly instead, unless I’m painting fabric- then of course, a soft wax. I wanted to get your take on furniture painting with you do not like the distressed chippy weathered glaze look. I like furniture that has a solid durable look to it. I’m undecided on Sheen now. Which type of paint do you think is best for this? I love the idea of chalk paint and its ease-of-use but I don’t want to disttress it so I don’t know if there is a point to using it I might even want a bit of shine which would mean using a satin or semi polyacrylic over top of it. I’m looking to paint my dining room chairs if that makes any difference so durability is very important I have three children. 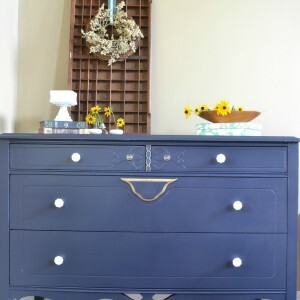 I would definitely recommend General Finishes Milk Paint based on the look that you want. 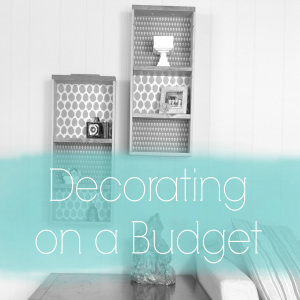 It’s way more durable than chalk paint, and it still easy to use. I just lightly sand the surface I am going to paint and it adheres really well. Then, you can go over it with a Polyacrylic (or GF makes an acrylic topcoat in all finishes – from flat to gloss). I found it holds up really well. I’ve painted chairs, kitchen and bathroom cabinets, and our nursery furniture with it and it’s holding up well. I hope that helps! Let me know if you have any other questions. Have you tried using Fusion Mineral Paint? And if so, how does it compare to the others? Hi Gina. I actually have not tried it, but it is on my list to do, because I have a couple of other paints I want to write about and I’d love to include that one as well. Sorry I’m of no help with this one, yet! I only recently discovered you and all I can say is you are a goldmine of information. I’m 68 and only now taking a more serious approach to painting furniture. I “studied” your paint primer and I’m still not sure what brands to look for in Acrylic Paint for my projects. Lowe’s gave me Zinsser Perma-White mold and mildew proof interior paint. Is that one of the paints to use on bookcase and small wooden projects? Hi Barbara. Thanks for your kind words, and for taking the time to comment and ask your question. I’ve never used the Zinsser primer you mentioned, but I really don’t think you’ll need that level of mold and mildew protection on small pieces of furniture. I’ve heard good things about Zinsser Smart Prime as a great primer, and it’s water based, which makes it so much easier to clean up. As for acrylic paint, I would recommend General Finishes. I’m always impressed every time I use it. I hope that helps. Why do you label the Valspar Optimus as a latex? It is acrylic. The specs clearly state so. Good question, and although I don’t fully understand the chemical compositions, I do know that basically all latex paints are actually acrylic latex. Some paints have higher levels of acrylic resins, which increase durability and adhesion, and in the picture, I labeled that as an “acrylic” paint. The names are so confusing though, and in my attempt to simply it all, it did come across as incorrect. Thanks for bringing up this good point! Such an informative post! I’m getting ready to paint an old metal file cabinet with maybe an eggshell finish. What do you suggest. I’m also painting an outdoor wooden bench with no distressed or chic look. What are your ideas? Hi Blair. Thanks for your questions. 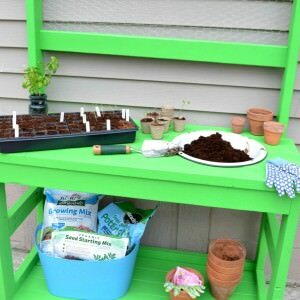 For the wooden bench, I would make sure to use an outdoor paint. Is it unfinished wood that you’re painting over? If so, I’d recommend a latex outdoor paint. Or, DecoArt makes an outdoor paint as well – I used it on this table that is outside. 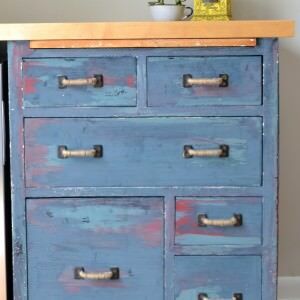 As for the metal file cabinet, enamel paint (spray paint is the easiest way to use this type of paint) will definitely work, or a chalk based paint should stick really well too. An acrylic paint should also work, but I would be sure to scuff up the entire surface before painting to be sure it adheres. Good luck on your projects! Great idea on the metal file cabinet! I may have to steal that. 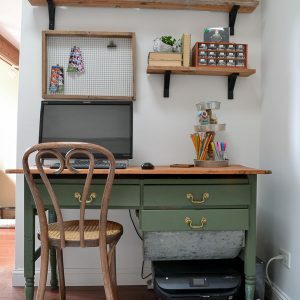 I am looking to repaint wood shelves in our house. Latex paint has a finish that sticks to things, so i am looking for the best recommendation that won’t stick to stuff and that can clean off easily if it gets dirty. What paint would be your choice for something like this? they will mostly be used for storage but we wanted something fun, that looks nice and also can take withstand things being put on it. I love acrylic paint – I use it for dressers and pieces of furniture that objects will be sitting on. That’d be my personal choice I think! This post is so so amazingly helpful! Thank you! Hi! I’ve just aquired an antique table and chairs I’m so excited to refinish, but I’d love some advice to get me going. I’ve refinished other things, but I don’t want to mess this one up! It’s got a dark Walnut finish currently. I think I’m going to use a gel stain on the top of the table take it slightly darker and richer. Then use the acrylic top coat on it. 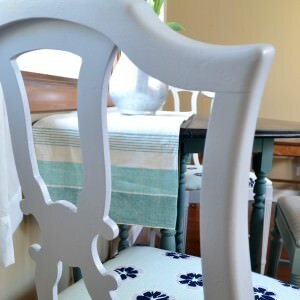 For the legs and chairs I want to do a slightly distressed white. I’m thinking of using chalk paint with the acrylic top coat. Does that sound like the right choice to you? Do I need to use something between the original stain and the chalk paint so that the stain doesn’t bleed through? I want some of that dark stain to pop through where it is distressed so a primer doesn’t sound right. I was thinking a layer of the acrylic top coat would help but then will the chalk paint adhere to the top coat? What are your thoughts? Thank so much! Hi Jenny – it sounds like a gorgeous piece! 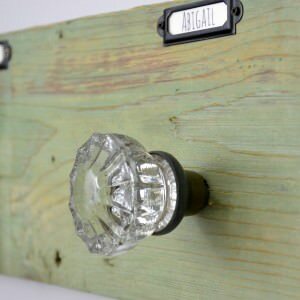 I think your ideas to use gel stain on the top and use an acrylic top coat should work perfectly, as will chalk paint with an acrylic top coat. As for bleed through, it’s very possible that you can just paint with chalk paint and there will no bleed through at all – it really depends on if the finish is in tact (and what was used for the finish originally). I would do a test on a part of the piece. If it’s going to bleed through, you’ll notice almost right away after it dries. If it does bleed through, I’d recommend using a clear sealer so you can still distress down to the wood without dealing with a white primer. Using a clear acrylic won’t block bleed through, you’ll need a different product. (I’ve used clear Shellac or Miss Mustard Seed Tough Coat and both work well). Then, after it dries just paint over with chalk paint as normal and finish with acrylic topcoat. But, hopefully you won’t even need to worry about bleed through in the first place! I hope that helps. Have fun! Thanks for the article! 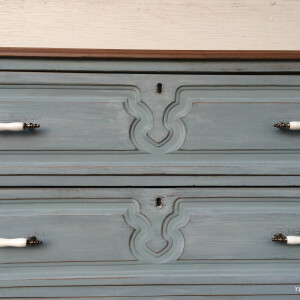 I painted my old armoire for my son’s room recently using Amy Howard chalk paint. I really liked it at first, but it has already started chipping! I cleaned it well beforehand and applied a wax when I was done, but I have to think that I should have done something else to avoid the chipping. Do I need to start completely over, or is there a way to touch up the chips and apply another layer? If so, what! Thank you so much! Hi Jenny. I apologize for the long overdue response. I think your comment got lost in the shuffle somewhere, and I’m going to find ones I missed along the way. Anyway, I’m surprised that it chipped, too. 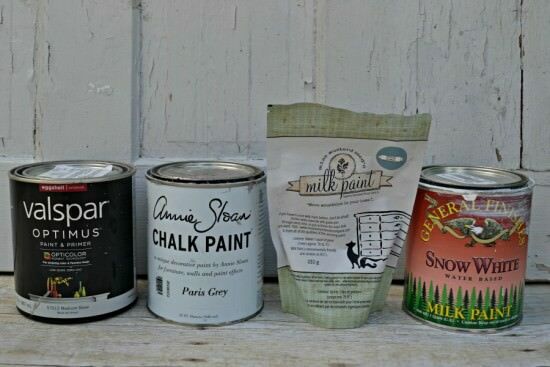 I’ve never used Amy Howard chalk paint, but every other brand I’ve used of chalk paint I haven’t had problems with chipping (unless I painted over something that was previously painted and that paint chipped, thus taking the chalk paint with it). I would assume that brand of paint would have great adhesion too, but I don’t really know from any of my experiences. To repair chipping, I sometimes will use my sander to sand down the chip so there is no longer a ridge between the paint and the place without paint. You could also use wood filler to fill in the chip gouges as well. You should be able to repaint the piece right over your wax (since it’s already cured). This time (if you haven’t started working on it yet), maybe try clear acrylic as the topcoat. My favorite brand is General Finishes top coat – it should help withstand any dings and such. Hope that helps in some way. Let me know if you have other questions! I am looking to find other brands of acrylic paint and can’t seem to pull any up. The brand you’ve mentioned above is not available in Canada. Hi Sarah. Good question! I’m pretty certain all of these brands are acrylic based: Fusion Mineral Paint, Black Dog Salvage, Mud Paint. I think Fusion is a Canadian-based company? I think? If you sign up as a subscriber in this post, I have a handy printable chart that lists the characteristics of the paints, as well as a lot of common brands for different types. That might be helpful, too! I am so scared to try milk paint! Okay, I’m going to do it 🙂 I have a dresser that has been waiting on a little TLC. 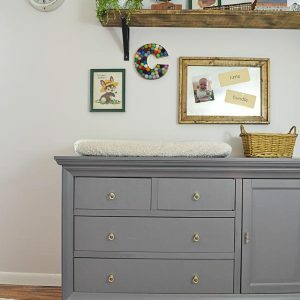 Last year I painted my dresser with a dark gray chalk paint. I’m not a big fan of it because it is hard to clean. I recently moved and the place I’m renting has dark walls and was hoping to paint over it with a white paint. I don’t mind if the gray is still lightly visible. Would it be possible to paint over the chalk paint with another type and what type do you recommend? Hi Maria. 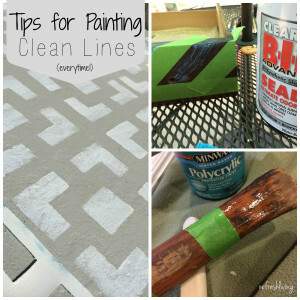 Chalk paint is very easy to paint over. Just a quick question, did you use a topcoat over the paint? If not, that might be why it’s hard to clean. 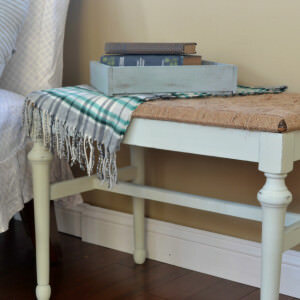 Chalk paint without a topcoat seems to collect and retain dirt and marks very easily. Either way, though, you can paint over it! I’d recommend using an acrylic paint, or even going over it with a white chalk paint. If you want it to be easier to clean, just do a topcoat with clear acrylic, or furniture paste wax. I hope that helps! It’s super confusing, especially because paint manufacturers are really starting to find the best blends for paints and don’t just keep to one paint type base. A lot of paints are now acrylic-latex blends (and a lot of wall paints are actually this blend now). Yes, acrylic based paints are just like the small bottles of acrylic paints at the craft store. I’ve found that most paints targeted specifically for furniture are now either chalk paint or furniture paint designed to give a more durable and shinier finish (these paints are generally acrylic based). A few other paints besides General Finishes that are primarily acrylic based (as best my research can find, because paint companies tend to be a bit inconspicious about the composition of their paint) are Fusion Mineral Paint, Black Dog Salvage Paint, Mud Paint, and Americana Satin Enamels (this is one of the same companies that makes the smaller bottles of acrylic paint at craft stores). I hope that helps some; good luck on the dresser! Thank you for that extremely concise, well-organized, and informative article. You are a talented writer as well as DIY artist! This was exactly the information I was looking for, and it was a pleasure to see it presented so well. Thanks so much for your positive feedback, Terry. I felt a bit overwhelmed when writing this post as there is so much information and it could be presented in many different ways, but I’m glad you found the format helpful. Hi! I just found your blog and really appreciate this paint type comparison. I need some advice: I’m wanting to refinish a big dining table for our new house. It’s kind of ornate so I’m hoping refinishing it in a more contemporary way will make it more our style. I’m wanting to do a wood top (planning to use a general finishes gel stain) and then do the table legs and chairs in a gray blue to match the fabric I bought to recover the chair seats. I was planning to use Annie Sloan chalk paint but now I’m not sure if that’s what would look best. I’m a total newbie to refinishing (I refinished our old table with a minwax polyshade and spray paint. It looked pretty good but it wasn’t very durable) and I want it to look nice and stay that way (is that possible with 4 kids??). Brush strokes will drive me crazy. I do have access to a paint sprayer. Also, because of the ornateness I’m not sure how easy it will be to sand (the table top could be sanded but I was told that’s not necessary with gel stain, correct? ), which is why I originally thought chalk paint. I don’t plan to do any distressing on it, I just want a nice clean finish. What do you suggest? I’m sorry for the delay in getting back to you. You’re right in that gel stain can be applied right to the table top over existing finish, as long as you are planning to go with a darker color (rather than lighter). 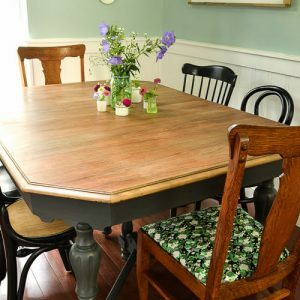 As for painting the legs, I actually refinished a dining table (but it’s in our kitchen and used every day by our family, which included three young (and destructive) kids.) I used General Finishes Milk Paint (although it’s not actually milk paint, it’s acrylic based) and love the results. I lightly sanded first and then brushed it on and it adhered very well. You could also easily spray it (and I’ve always been happy with how GF Milk Paint sprays on, just be sure to thin it out first). I did use an acrylic topcoat (I’m guessing it was General Finishes Flat Topcoat, but I can’t remember specifically. I think I did two coats just to help with wear and tear. The paint has held up very well (it’s been over two years since it was painted) and the only place where the paint is wearing is right at the bottom of one edge where my daughter’s high chair was pushed into it day after day. I’ve been meaning to touch it up and just haven’t got the chance! I hope that helps some, if you haven’t already finished your project. 🙂 Have fun!